Graphene can adsorb oxygen onto its surface (which changes graphene's electronic transport properties). This can be useful for Spintronics devices, but the adsorption is difficult to control. 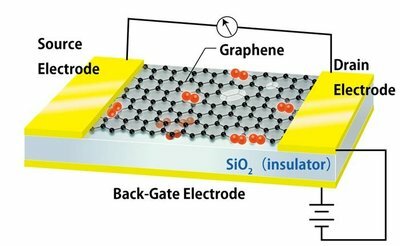 Researchers from the Tokyo Institute of Technology developed a way to control the adsorption of oxygen by applying an electric field to a Graphene-based field-effect transistor (FET).